Fabricated from heavy gauge wire for years of use. Space-saving way to display selling merchandises. 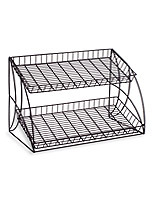 Features 3 open-design wire trays for displaying many items. This countertop stand, display rack is a perfect addition to any restaurant, supermarket, pharmacy, convenient store or other retailer. Built from welded wire with a black powder coated finish, this three tier fixture can easily blend into any retail setting. 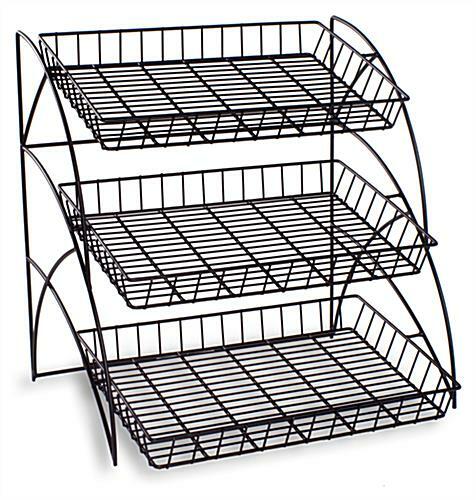 A wire stand, display rack has three open shelves. Each wire tray is made with horizontal cross bars to add strength to the unit. 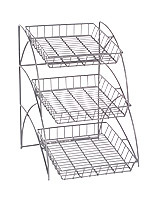 A display rack can be used to present small goodies such as packaged foods, candy or toiletries. 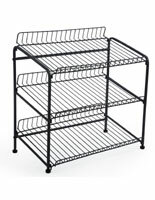 Not only does this display rack help save space, but it also allows you to display many items on one single rack. 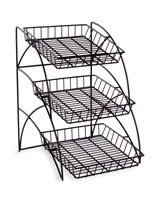 Use this tiered stand to offer fruits, pre-packaged foods or toiletries. 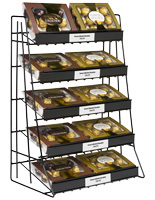 Displayed at an angle, this display rack offers a full-view to customers, allowing them to make a quick selection. All three tiers are accessible without having to make any adjustments. Position this display rack near cash-out areas to lure last minute buyers to purchase additional items before they checkout. This three tier stand can help to increase sales and profits, and at the same time, make your merchandise look organized. We ship this display rack unassembled to customers. This countertop stand, also known as a metal fixture, is quick to set up and easy to use. 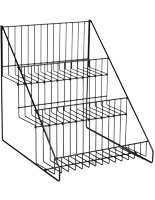 Add this display rack to your store today! 20.5" x 20.0" x 17.5"
It is a very sturdy and easy to handle product.. Arrived broken. I emailed about it. Displays 2 go asked for my order #. No other correspondence. 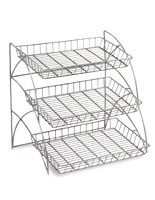 We're so sorry to hear your wire rack arrived broken, Dan! This is something we can certainly rectify for you. One of our customer care specialists will look into your order and see what happened with the email. Thank you for your patience! The size and display of this rack is perfect for our flag football snack bar! Unfortunately 2 out of 3 racks arrived broken. The welding of the basket to the stand did not withstand the shipping, and there was no packing material in the box to prevent breakage. Customer service was excellent and replaced the first broken rack, only for the replacement to also arrive broken! I gave up and will make do with the broken one. Hi Eric, We're so sorry to hear about this frustrating situation! This is certainly not how we want our customers' shopping experiences to go. We're confident we can rectify this, however, so one of our customer care specialists will reach out to assist. Thank you for letting us know! This was the perfect sized snack shelf to fit on the counter in our office kitchen. Delivery was quick and hassle free! Love this display! Great quality. Perfect for what we needed.